WAN’s sister title Horticulture Week held an event focusing on green infrastructure on 29.11.17 on London’s south bank. 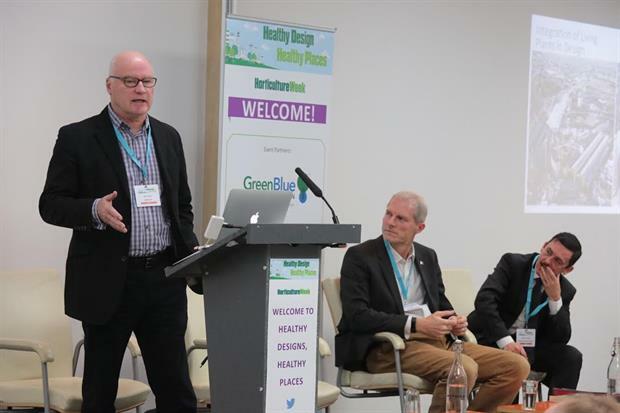 The ‘Healthy Design, Healthy Places’ conference drew landscape designers, property developers, architects and environmental services providers who shared evidence, ideas and examples of how to promote and highlight green infrastructure in new developments. The best way to build the case for investing in green infrastructure was outlined with case studies including a residential scheme in Barrow and the Kings Cross Station redevelopment. The scheme in Barrow featured quality landscaping, commissioned specifically to improve health outcomes and more than quadrupled the value of the previously run down housing. Landscape promoters were strongly advised to identify a green infrastructure champion in any new development, be more assertive among construction colleagues - and push hard for post-installation management plans. The risk that efforts to increase density could succeed at the expense of landscaped space was also identified. Mark Camley, London Legacy Development Corporation’s executive director of park and venues chaired the event. He focussed on the need to increase life expectancy in the capital and emphasised how green infrastructure could contribute to this aim using the example of Queen Elizabeth Olympic Park in Stratford as a positive addition to an urban neighbourhood. Senior project manager for Argent, Ken Trew described how building the public realm at the King’s Cross regeneration scheme was key to winning buy in from the public, helping to promote the scheme to future potential tenants. "We don’t wait until we finish projects to talk to estate management," said Trew who convinced the property company to appoint someone with the right experience to oversee the management of the landscape post installation: "It pays for itself because we have invested in the landscape. The tenants want to see the grass alive – they won’t pay the service charge otherwise." Trew highlighted competition between developers as an opportunity for landscape promoters: "We’re all trying to attract investors and so we are trying to outdo each other. It has lifted the quality of design and implementation of the landscape." Also speaking was research director from the Centre for Sustainable products at BRE, Ed Suttie, who outlined the details of the first major built environment sector biophilic design study that will generate evidence of occupant benefits of a greener workplace. Said Suttie: "We need to start talking about positives – the enriching, the restorative – that is where horticulture plays a positive role and connects to the healthy design brief." The event also heard learnings from One World Design’s Chris Medland who created Europe’s largest green wall on the car park of the National Grid, and BDP director of landscape architecture Mehron Kirk who is leading the design for Westminster’s pilot ‘Green Spine’ project due to go through planning next week. The project aims to create London’s most "liveable" neighbourhood, promoting healthy streets by changing the existing character and integrating a host of new uses and activities. A full report on the conference which was sponsored by GreenBlue Urban and supported by media partners Efig, the Construction Industry Council and sister publications World Architecture News and Planning will be published shortly.